Clarets boss Sean Dyche admits mistakes cost his side dearly in their FA Cup third round replay defeat at Spurs. Burnley saw an early 2-0 lead evaporate by half-time, before Tottenham sealed a fourth round date with Leicester after the break, winning 4-2. Marvin Sordell’s first goal for the club was quickly followed by a Ross Wallace free kick, deflected in off Roberto Soldado, but Spurs came roaring back, and Dyche said: “I don’t know whether we let it get away, they’re a good side and even when they make changes they’re still a good side. “But when you’re 2-0 up and you make the mistakes we made, it’s going to be very tough. 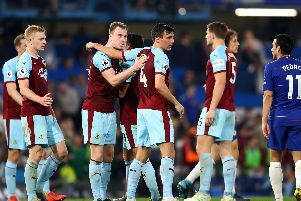 Dyche made five changes from the side which had started seven successive league games, with Sam Vokes and Michael Duff handed starts after injury, and he explained: “I felt the players that have played seven games on the trot...we’re not naive, we know they’re human, but beyond that, I was enthused by the team early on, I thought players were champing at the bit to make a point, to get back in the side etc. “Generally there were some good performances, but the details, that we’re getting better at, really hurt us. “They supplied good details, and we didn’t. “The mistakes, particularly for the first two goals - you can’t get away with that, certainly not at this level, as we’ve already learned.